Moncton, New Brunswick was home to the No. 8 Service Flying Training School, the No. 1 Wireless School, the No. 1 Y Depot, the No. 31 RAF Personnel Depot, the No. 18 Equipment Unit, the No. 15 Recruit Depot, In the summer of 1941, a large piece of land by the CN Shops (near the present location of the YMCA on Vaughan Harvey Boulevard) was turned into a “Town within a City” to accommodate the incoming Aircrews. Some of those buildings built in haste still stand today. Other New Brunswick communities affected by the Training Plan included Salisbury, Chatham and Pennfield Ridge near Saint John. Planes based in nearby Debert, Nova Scotia., also made regular runs over Moncton. Graduates of the EFTS “learn-to-fly” program went on a Service Flying Training School (SFTS) for 16 weeks. For the 1st 8 weeks the Student was part of an Intermediate Training Squadron; for the next 6 weeks an Advanced Training Squadron and for the final 2 weeks Training was completed at a Bombing & Gunnery School. The SFTS were Military Establishments run by the RCAF or the RAF. There were 2 different types of SFTS. Recruits in the Fighter Pilot Stream went to an SFTS where they Trained in the North American Harvard or North American Yale. Recruits in the Bomber, Coastal or Transport Pilot Stream went to an SFTS where they learned multi-engine Technique in an Airspeed Oxford, Avro Anson or Cessna Crane. No. 8 Service Flying Training School. No.31 RAF Personnel Depot, Moncton, New Brunswick, Canada. Stations were built to a Standard plan. There was a Triangular set of Runways with associated Taxi-strips and Hangers, and a large 2-storey H block with double tier bunks in the Arms of the ‘H’ and Showers & Toilets in the Crossbar. This would accommodate 8 Flights Flying Avro Ansons. Became RN 31 RAF Depot (sic) 1st July 1942. 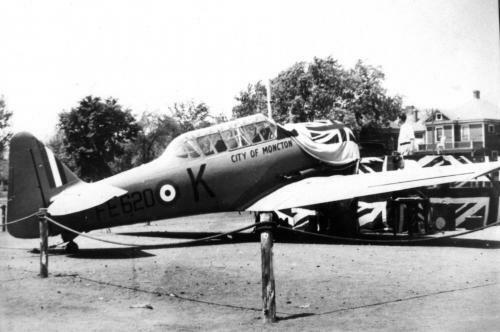 The British Commonwealth Air Training Plan saw more than 130,000 Personnel from Great Britain, Canada, Australia & New Zealand Graduate from 107 Training Schools across Canada – a remarkable feat by any standard; one that President Franklin Delano Roosevelt called the “Aerodrome of Democracy”. Canada was an ideal location to Train Aircrew as it was far enough away from the Fighting, with plenty of Land away from Towns & Cities to build Training Schools. Dozens of Airfields were constructed in specific locations across the country, seemingly random, but with an eye to the post-war years when the Airfields would be turned over to the local Communities. Many Municipal Airports were originally RCAF aerodromes. Moncton, New Brunswick was home to the No.8 Service Flying Training School, the No.1 Wireless School, the No.1 Y Depot, the No. 31 RAF Personnel Depot, the No.18 Equipment Unit, the No.15 Recruit Depot, In the summer of 1941, a large piece of Land by the CN Shops (near the present location of the YMCA on Vaughan Harvey Boulevard) was turned into a “Town within a City” to accommodate the incoming Aircrews. Some of those buildings built in haste still stand today. Other New Brunswick Communities affected by the Training Plan included Salisbury, Chatham & Pennfield Ridge near Saint John. Planes based in nearby Debert, Nova Scotia., also made regular runs over Moncton. We rolled into Moncton on time and made our way to the RAF Repatriation Depot. It being an RAF Station it was the Point of Departure for 1,000s of RAF men who had Trained in Canada. I was only there 15 days and didn’t think much of the place. The food was very poor, both in quality & quantity and it almost seemed that we were being further conditioned for Wartime Rations in Britain. After all, we were still in Canada where food was quite plentiful. So we ate in Town a lot.